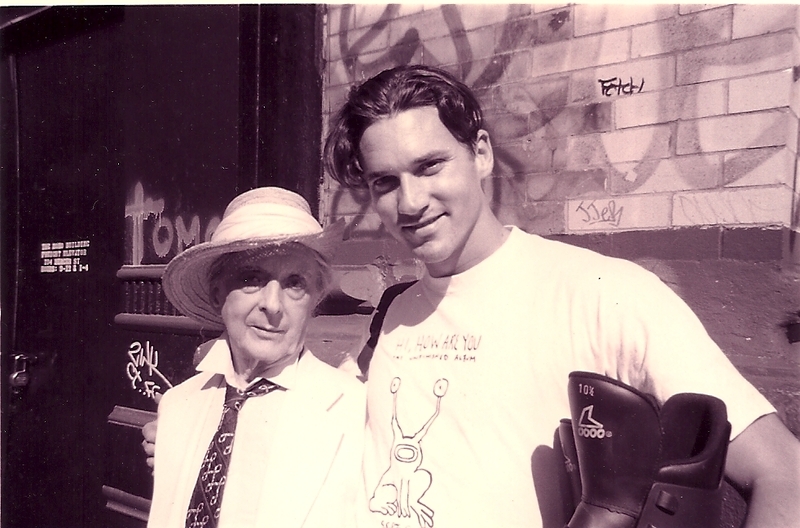 During the last week of July in 1995, I visited Manhattan and invited Quentin Crisp to a matinee. It was the opening weekend of Larry Clark’s “Kids,” which was screening at only two U.S. theaters — both in New York. I rollerbladed to Quentin’s apartment, and he greeted me in a seersucker suit with his lavender ponytail tucked beneath a raffia-straw brimmed hat. His cheeks were evenly powdered, and his lips were blushed with a smear of plum. Since we arrived at the theater a little early, Quentin wanted to mail some letters. In search of a postbox, Quentin jaywalked without bothering to look at oncoming traffic. Pissed-off drivers honked their horns and came to a screeching halt. He was nearly run over with me chasing after him. When we spotted a mailbox across another street, Quentin turned to me, raised his eyebrows and cackled, “It looks like we’ll have to risk our lives again.” Then he raced back into traffic. I wanted to tackle him and slap his face. When we entered the theater, Quentin informed me that he only agreed to join me so he could escape the oppressive summer heat. After the film, he declared his dislike for children and said “Kids” was the filthiest movie he’d ever seen. Outside the theater, Quentin introduced me to an acquaintance who snapped our portrait. Then we all escorted Quentin back to his apartment. While saying goodbye, I reached to shake his hand. I asked him to promise that he’d exercise more care while crossing streets. Quentin was reluctant. He wouldn’t look me in the eye — as if the request was too ridiculous. But I refused to release his hand until he gave me his word. When he relented and swore to be a more cautious pedestrian, his friend burst into applause. Hey, Quentin. We saw the movie “Kids” together. How are you? Oh, yes. I’m all right, thank you. ​Have you been traveling lately? Not really. Tomorrow, I’ll go to Connecticut — to the house of a painter called Spider Webb. He wants to paint a canvas of me sitting beside a lake. Do you like Spider’s paintings? I’ve only seen some of it. He previously painted my portrait and wishes to treat it like “The Picture of Dorian Gray.” It will grow older, and I’ll remain the same. Did you like the movie “Kids?” I hated it. Did you think it was well-crafted? Well, I think you were meant to hate it. So in that sense, it was good, yes. I think every child should be made to see it. Did you believe “Kids” effectively addressed HIV? I never considered that. Films like “Longtime Companion” and “Philadelphia” had so many expectations placed upon them. That’s true. But, no. I thought “Kids” was meant to be — as I say — disgusting. And it succeeded. But they say no child is allowed to see the movie, which is a waste. Children should see it to understand how disgusting they are. I noticed you had a cameo in “To Wong Foo.” Oh, yes. Did you enjoy working on that film? It was made in Webster Hall, which is only up on 11th Street. So it wasn’t far for me to go. And I didn’t have to do anything except sit there. So I didn’t mind making that film. ​Did you see it? Yes. Did you like “To Wong Foo? I hated it. Why? Well, it’s Disneyfied. It’s made on the model of “Priscilla, Queen of the Desert.” And that was a wonderfully wounding and sad film. “To Wong Foo” was prettied-up. It suggests that drag is in no way connected with homosexuality, which is nonsense. “Some Like It Hot” was about drag and didn’t have much to do with homosexuality. Yes, but I liked that movie. Quentin, what color is your hair? White. Why? Don’t you add a purplish tint? Oh, yes. You color it with a punked-out lavender rinse. Yes. Is this the best year you’ve ever had? I don’t think so. I think it’s about the same as most of the time that I’ve been in New York. I like living in New York, and I’m glad I came here. But I don’t think it gets any better. I’m 26 years old. What’s one thing you know you’ve learned since you were 26? That I don’t have to win. Boy George is currently promoting his autobiography, which you were asked to review in advance. What did you think of his writing? The book is extraordinary. I was asked to write something for the rear jacket. I said I couldn’t help praising his candor. Most people who write the story of their lives are concerned to admit that they were promiscuous. But Mr. George not only fornicated with strangers, he quarreled with his lovers. He deserted his fans. He stole from his employers. There was nothing he didn’t do. Have you met Boy George? Yes. He’s very nice. Do you appreciate his talent? I can’t. His talent is in music, and I don’t understand music. You recently went to Austria, right? Yes. You didn’t enjoy any of Austria’s somber music, did you? Oh, I hated it. How would you categorize your sexuality? I’m of indeterminate gender. What do you think of affirmative action? All that stuff is rubbish. Anything that makes a fuss and demonstrates and all that — I think it’s a waste of time. Even if demonstrating accomplishes a goal, like, civil rights and equality? Nothing is accomplished. Anger begets anger. That’s an unalterable law. You just annoy the world by flying into a rage with it. Instead of trying to improve civilization, what should one do with one’s time? Waste it. Quentin, do you have air conditioning? No. Why not? I live in a room. The electricity belongs to the landlord. Can’t you phone him and say, “I need air conditioning. It’s hot, and I’m not getting any younger.” I wouldn’t dare. Shall I make the call for you? No. I could get you air conditioning in one day. That would be wrong. I suggested that you become the spokesmodel fo Roller-Blades. Remember, we talked about how William S. Burroughs now endorses Nike shoes? Oh, yes. How about I get you up on a pair of RollerBlades. Roller-Blades? But I’d crash to the ground. But if we got you to stand up for a few seconds, take a picture of you, you could get, like, $5,000. Then you’d enjoy air conditioning during the summer. I can’t have air conditioning. It belongs to the landlord. Your landlord keeps you on a short leash, Quentin. I bet he’s got air conditioning. Yes. He does. ​Well, I just wanted to say howdy. You take care of yourself and watch out when you’re crossing the street. We’ll talk again soon. Lovely.